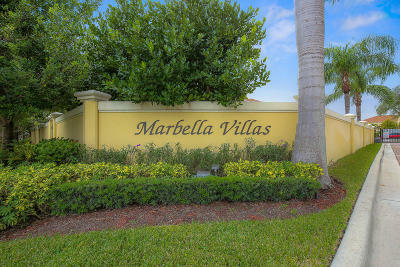 The quaint Gated Community of Marbella Villas is one of North Palm Beach's best kept secrets. Large kitchen with oak flushed cabinets, granite counter tops, stainless steel appliances and large seating bar. Open design lives large to include living room, dining and kitchen. 3 Bedrooms and 2.5 Baths, 9 ft. ceilings, crown molding and tray ceiling. Large master bed and bath with walk-in closet, double sinks, shower and separate soaking tub. Exterior includes outdoor patio and 1 car garage plus a community swimming pool.